Want to make the BEST taco meat ever? 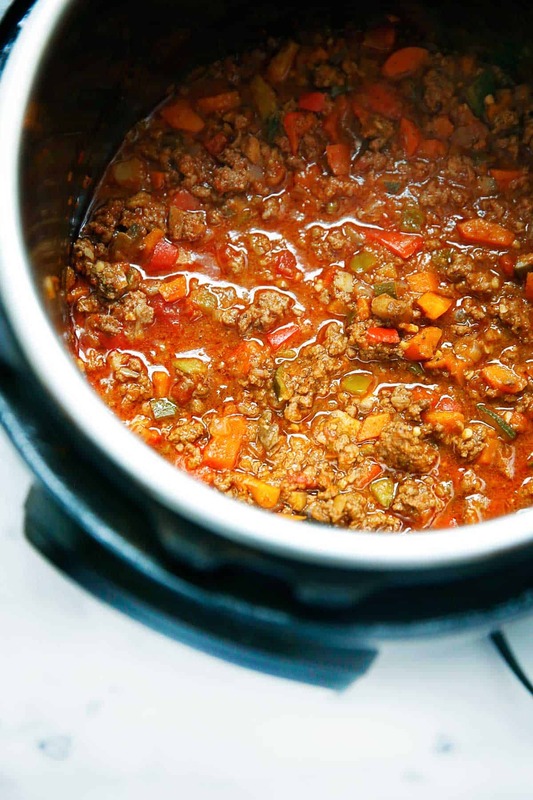 This taco meat recipe is loaded with hidden veggies and is made in the Instant Pot pressure cooker! 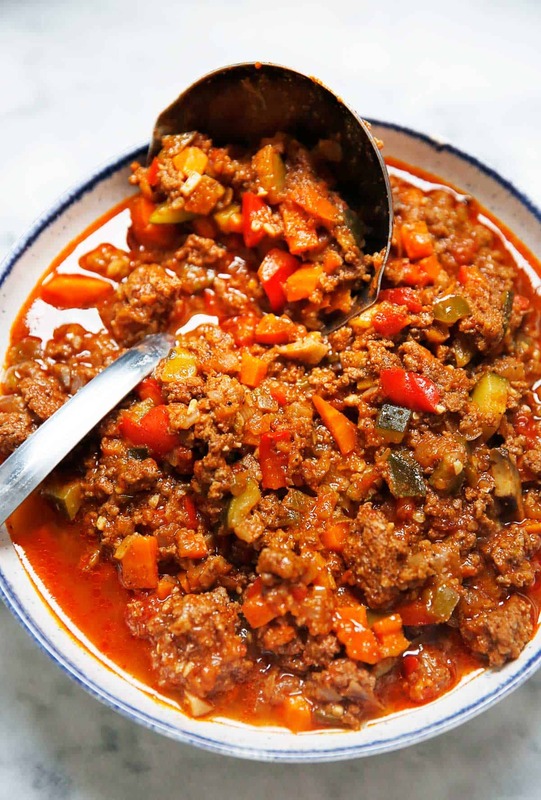 It comes together in under 30 minutes and tastes like your favorite classic, indulgent taco meat! It’s whole30-compliant and a recipe the whole family will love! Growing up I LOVED Taco Bell. Yes, you read that right. I have given up my love for Taco Bell, but I haven’t given up my love for classic beef tacos. 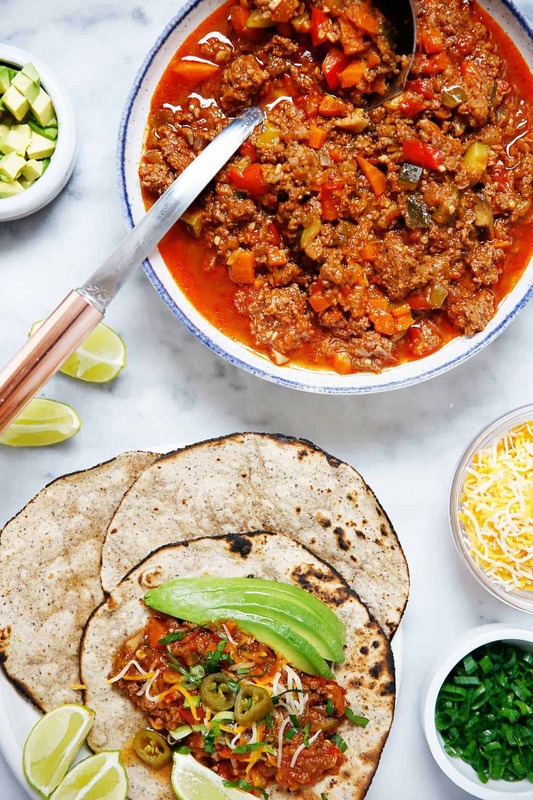 This taco meat recipe tastes like the classic taco meat you love, but made healthy and delicious. From one taco lover to another, I promise you’ll love this recipe! You are going to love how quickly this taco meat is to make, and how you sneak all the veggies into your families taco night! P.S. Did you know you can see all of my pressure cooker recipes in one spot? Find them all here! What spices do you put in taco meat? How do you make the best tacos? Follow this recipe and I promise you will have the BEST taco night ever! 1. Heat oil and sauté veggies for about 4 minutes, until they begin to soften. 2. Add in the meat and cook for 2-3 minutes until browned. 3. Add in spices and mix to combine. Add in the salsa. 4. Seal the lid and then cook under high pressure for 15 minutes. 5. Turn the knob to quick release. Add in spinach while hot and mix until wilted. 6. Serve with your favorite taco fixins' and enjoy! Taco fixin' ideas: grain-free tortillas, lettuce, tomato, cheese, jalapeños, scallions, avocado, cilantro, lime. Note: If your meat is very fatty, you may want to drain it before adding the spices and salsa. Make it in the slower cooker: In a skillet, sauté veggies and brown the meat. Add everything into your slow cooker and cook on low for 8 hours. THis looks so good! Just in time for taco night in our family! That’s the best taco meat I have EVER seen!! Hooray for the extra veg! My boys will love this for Taco Tuesday! Can you make this recipe in the slow cooker? The recipe was so quick, super easy, and filled with added vegetables. We enjoyed it over a bed of spegetti squash, but it would also be amazing with cauliflower rice. It was our first instapot time using the instapot and we couldn’t be more excited to make it again. Love the hidden veggies in this taco meat! Super easy too in the IP! Just in time for Taco Tuesday!! Mine came out really runny. I didn’t instant release will that cause the extra liquid? Newbie cooker here. The flavor was bomb! Was your beef very fatty? If so, may want to drain out some of the fat before adding salsa. This was amazing! So easy and so fast. I also had a ton of liquid though. My beef wasn’t super fatty so I’m not sure what it was! I followed the recipe as written. Maybe the mushrooms released a lot of liquid? I’ll try adding less salsa next time. Still a great recipe! What kind of grain free tortillas do you use? Couldn’t catch the name during your video. I’m going to buy your cookbook soon, love your recipes. Can I make it with frozen ground turkey? It does it need to be thawed? I haven’t tried it with frozen. Let us know if you do! Love this recipe but was wondering if you have nutritional/ calorie counts? Felt so sneaky getting all of these vegetables into taco meat. Great recipe that the whole family enjoys. A weekly staple in our house; I’ll never go back to taco meat any other way! I kick it up with extra heat/spice for my own taste. Love all the loads of veggies in it. Made this tonight and it was the best taco meat ever. I shredded the zucchini and carrots and they weren’t detectable by the kids. I used a salsa without sugar but I think the carrots gave t a little sweetness cause my husband said it tasted a little like sloppy joe meat with a Mexican flair. I will never make taco meat any other way! This taco meat is just the best! It is so easy to put together, and cooking it in the Instant Pot gave me time to saute up some Siete tortillas and plantains while the meat was cooking! I also loved sneaking in some veggies for my non-veggie loving husband. This recipe is delicious!!! I want to double (or triple!) the recipe… how do I adjust the cooking time? So delicious!!! Question: How would I adjust the cooking time if I want to double (or triple!) the recipe? Audrey, I just made the recipe doubled and did the final cook time for 25 mins. using beef not turkey. It turned out great, not watery or dried out. We are not allowed salsa on the diet plan, can we sub the salsa/liquid out with chicken broth? Hi Jenilee! My best guess is that would work! Canned tomato sauce definitely works. If you give it a try, let us know!